I was mightily impressed when I received Doomsday Outlaw's previous album 'Suffer More' for review in Fireworks #75. Since then, the Derby based quintet have deservedly been signed by Frontiers for the release of 'Hard Times'. It's actually their third album, but it seems their 2015 debut 'Black River' has all but been disowned by the band since vocalist Phil Poole joined the ranks following its release. Arguably, it's Poole's presence that has helped take Doomsday Outlaw to the next level and the band, rounded out by guitarists Steve Broughton and Gavin Mills, bassist Indy Chanda and drummer John "Ironfoot" Willis, have once again delivered an absolute corker. Black Stone Cherry have been cited as a major influence, and it's their heavier, contemporary take on Southern Rock that clearly determines where Doomsday Outlaw's sound is rooted. However, 'Hard Times' subtly relinquishes the more obvious Southern style in favour of a bluesy, Led Zeppelin-inspired stomp. The dirty, Grunge-soaked riffage of opening salvo 'Hard Times', 'Over And Over' and 'Spirit That Made Me' display a hefty, confident swagger, and as 'Bring It On Home', 'Days Since I Saw The Sun' and the slightly funky 'Break You' demonstrate, the melody quotient has been expanded as well. With a healthy portion of the songs being fairly lengthy (around the six-minute mark) plentiful room is allowed for the instrumentation to breathe – the energetic finale to 'Were You Ever Mine' being a fine example. Yet for all the rousing Blues bombast, Doomsday Outlaw also know when to kick back and up the emotional stakes; the stark, piano/orchestrated ballad 'Into The Light' is achingly beautiful and exhibits the soulful side of Phil Poole's delivery, while the eight-minute 'Will You Wait' is powerfully expressive Blues balladry at its finest – think Thunder at their most stirring and darkest – and once again the orchestrated section during the instrumental break embellishes the song beautifully. A more concise album than its predecessor (at just under fity-nine minutes! ), it's perhaps not quite as diverse as 'Suffer More' but will ultimately be more accessible as a result. The only negative I can find is that too many tracks fade out when a big finish would be more favourable. 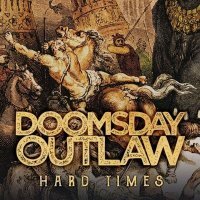 That very slight criticism aside, Doomsday Outlaw are doing everything right.